While many of his colleagues saw action in the Mexican–American War, Sherman performed administrative duties in the captured territory of California. Along with fellow Lieutenants Henry Halleck and Edward Ord, Sherman embarked from New York on the 198-day journey around Cape Horn aboard the converted sloop USS Lexington. Due to the confined spaces aboard-ship, Sherman grew close to Halleck and Ord, and in his Memoirs references a hike with Halleck to the summit of Corcovado overlooking Rio de Janeiro in Brazil, notable as the future spot of the Cristo Redentor statue. Sherman and Ord reached the town of Yerba Buena, in California, two days before its name was changed to San Francisco. In 1848, Sherman accompanied the military governor of California, Col. Richard Barnes Mason, in the inspection that officially confirmed that gold had been discovered in the region, thus inaugurating the California Gold Rush. Sherman, along with Ord, assisted in surveys for the sub-divisions of the town that would become Sacramento. Sherman's military record in 1862–63 was mixed. In December 1862, forces under his command suffered a severe repulse at the Battle of Chickasaw Bayou, just north of Vicksburg, Mississippi. 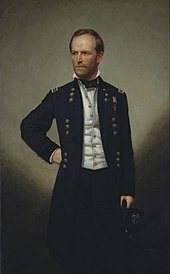 Soon after, his XV Corps was ordered to join Maj. Gen. John A. McClernand in his successful assault on Arkansas Post, generally regarded as a politically motivated distraction from the effort to capture Vicksburg. Before the Vicksburg Campaign in the spring of 1863, Sherman expressed serious reservations about the wisdom of Grant's unorthodox strategy,  but he went on to perform well in that campaign under Grant's supervision. 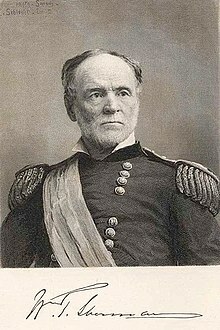 Command in the West was unified under Grant ( Military Division of the Mississippi), and Sherman succeeded Grant in command of the Army of the Tennessee. Following the defeat of the Army of the Cumberland at the Battle of Chickamauga by Confederate General Braxton Bragg's Army of Tennessee, the army was besieged in Chattanooga, Tennessee. Sherman's troops were sent to relieve them. While traveling to Chattanooga, Sherman departed Memphis on a train that arrived at the Battle of Collierville, Tennessee, while the Union garrison there was under attack on October 11, 1863. General Sherman took command of the 550 men and successfully defended against an attack of 3,500 Confederate cavalry. 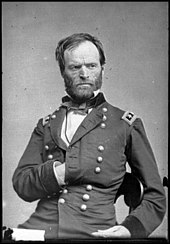 After ordering almost all civilians to leave the city in September, Sherman gave instructions that all military and government buildings in Atlanta be burned, although many private homes and shops were burned as well. This was to set a precedent for future behavior by his armies. Local Native American Lumbee guides helped Sherman's army cross the Lumber River, which was flooded by torrential rains, into North Carolina. According to Sherman, the trek across the Lumber River, and through the swamps, pocosins, and creeks of Robeson County was "the damnedest marching I ever saw." Thereafter, his troops did little damage to the civilian infrastructure, as North Carolina, unlike its southern neighbor, was regarded by his men as a reluctant Confederate state, having been the second from last state to secede from the Union, before Tennessee. Sherman's final significant military engagement was a victory over Johnston's troops at the Battle of Bentonville, March 19–21. He soon rendezvoused at Goldsborough, North Carolina, with Union troops awaiting him there after the capture of Fort Fisher and Wilmington. The government in Washington, D.C., refused to approve Sherman's terms and the Secretary of War, Edwin M. Stanton, denounced Sherman publicly, precipitating a long-lasting feud between the two men. Confusion over this issue lasted until April 26, 1865, when Johnston, ignoring instructions from President Davis, agreed to purely military terms and formally surrendered his army and all the Confederate forces in the Carolinas, Georgia, and Florida, in what was the largest single capitulation of the war. Sherman proceeded with 60,000 of his troops to Washington, D.C., where they marched in the Grand Review of the Armies, on May 24, 1865, and were then disbanded. Having become the second most important general in the Union army, he thus had come full circle to the city where he started his war-time service as colonel of a non-existent infantry regiment. Four days later, Sherman issued his Special Field Orders, No. 15. The orders provided for the settlement of 40,000 freed slaves and black refugees on land expropriated from white landowners in South Carolina, Georgia, and Florida. Sherman appointed Brig. Gen. Rufus Saxton, an abolitionist from Massachusetts who had previously directed the recruitment of black soldiers, to implement that plan. Those orders, which became the basis of the claim that the Union government had promised freed slaves " 40 acres and a mule", were revoked later that year by President Andrew Johnson. Sherman's advance through Georgia and South Carolina was characterized by widespread destruction of civilian supplies and infrastructure. Although looting was officially forbidden, historians disagree on how well this regulation was enforced. Union soldiers who foraged from Southern homes became known as bummers. The speed and efficiency of the destruction by Sherman's army was remarkable. The practice of heating rails and bending them around trees, leaving behind what came to be known as " Sherman's neckties," made repairs difficult. Accusations that civilians were targeted and war crimes were committed on the march have made Sherman a controversial figure to this day, particularly in the American South. Literary critic Edmund Wilson found in Sherman's Memoirs a fascinating and disturbing account of an "appetite for warfare" that "grows as it feeds on the South". Former U.S. Defense Secretary Robert McNamara refers equivocally to the statement that "war is cruelty and you cannot refine it" in both the book Wilson's Ghost  and in his interview for the film The Fog of War. But when comparing Sherman's scorched-earth campaigns to the actions of the British Army during the Second Boer War (1899–1902)—another war in which civilians were targeted because of their central role in sustaining an armed resistance—South African historian Hermann Giliomee declares that it "looks as if Sherman struck a better balance than the British commanders between severity and restraint in taking actions proportional to legitimate needs". The admiration of scholars such as Victor Davis Hanson, B. H. Liddell Hart, Lloyd Lewis, and John F. Marszalek for General Sherman owes much to what they see as an approach to the exigencies of modern armed conflict that was both effective and principled. Despite this language, there was little large-scale military action taken against the Indians during the first three years of Sherman's tenure, as Sherman was willing to let the process of negotiations play out in order to buy time to procure more troops and allow the completion of the Union Pacific and Kansas Pacific Railroads. During his time as departmental commander, Sherman was a member of the Indian Peace Commission. Though the commission was responsible for the negotiation of the Medicine Lodge Treaty and the Sioux Treaty of 1868, Sherman was not particularly privy in either due to being called away to Washington during the negotiations of both. In one such instance, he was called to testify in the impeachment trial of Andrew Johnson. However, Sherman was successful in negotiating other treaties, such as the removal of Navajos from the Bosque Redondo to traditional lands in Western New Mexico. When the Medicine Lodge Treaty was broken in 1868, Sherman authorized his subordinate in Missouri, Philip Sheridan, to conduct the Winter Campaign of 1868–69 (of which the Battle of Washita River was a part), where Sheridan used hard-war tactics similar to those he and Sherman had employed in the Civil War. Sherman was also involved with the trial of Satanta and Big Tree: he ordered that the two chiefs should be tried as common criminals for their role in the Warren Wagon Train Raid, a raid that came dangerously close to killing Sherman himself. He lived most of the rest of his life in New York City. He was devoted to the theater and to amateur painting and was much in demand as a colorful speaker at dinners and banquets, in which he indulged a fondness for quoting Shakespeare. 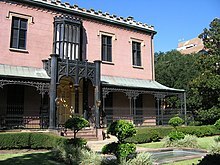 During this period, he stayed in contact with war veterans, and through them accepted honorary membership into the Phi Kappa Psi Fraternity and the Irving Literary Society. Sherman was proposed as a Republican candidate for the presidential election of 1884, but declined as emphatically as possible, saying, "I will not accept if nominated and will not serve if elected." Such a categorical rejection of a candidacy is now referred to as a " Shermanesque statement". Other posthumous tributes include Sherman Circle in the Petworth neighborhood of Washington, DC, the naming of the World War II M4 Sherman tank,  and the "General Sherman" Giant Sequoia tree, the most massive documented single-trunk tree in the world. The presentation of Sherman in popular culture is now discussed at book-length in Sherman's March in Myth and Memory (Rowman and Littlefield, 2008), by Edward Caudill and Paul Ashdown. Some of the artistic treatments of Sherman's march are the Civil War era song " Marching Through Georgia" by Henry Clay Work; Herman Melville's poem "The March to the Sea"; Ross McElwee's film Sherman's March; and E. L. Doctorow's novel The March.